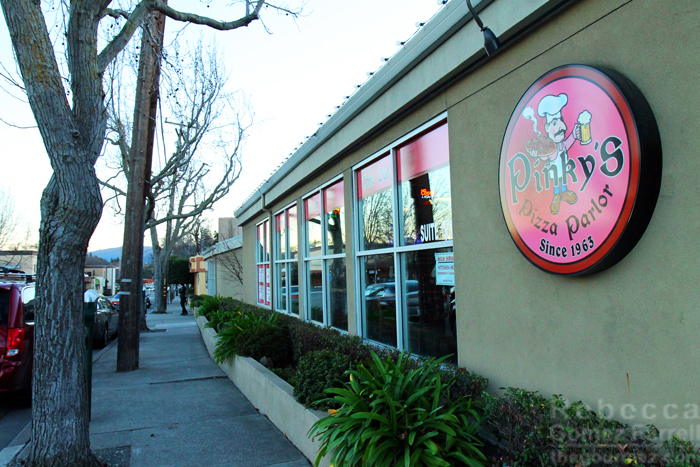 Pinky’s Pizza Parlor is a neighborhood joint worth leaving your neighborhood for. Two of our good friends are regulars, drawn in by the amazing bar specials Pinky’s runs, and we’ve joined them a number of times. On a Sunday, go for the $2 bloody marys. 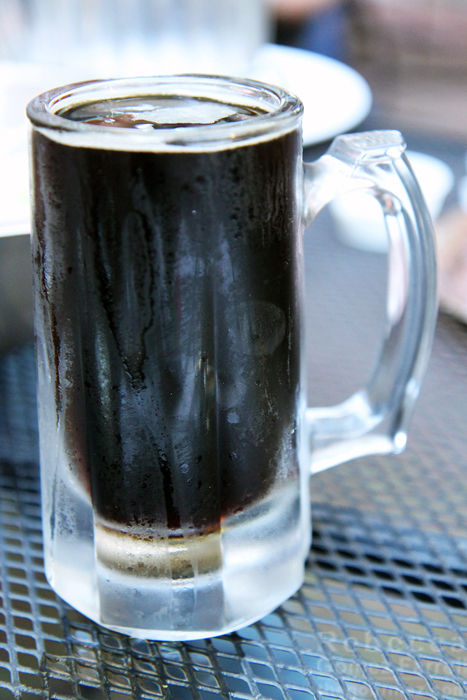 On a Thursday, get any draft beer for the same price, including their half-dozen craft options. I won’t even mention the deals on pitchers. I’m as much of a fan of their main draw — pizza — as I am of their bar deals. It’s Californian in style, i.e., fit as many toppings on a pie as possible and bake a crust with enough substance to support them. For me, that’s perfect. New Yorkers, however, will be disappointed — these slices do not flop over from length or grease. Instead, they satisfy with plenty of creative combinations and a crust that’s extra crunchy at the ends. The cheese is a blend of mozzarella, cheddar, and provolone. The pie pictured above is half “Bud Jones” and half “Randy’s Hot Friday,” and I am not going to list the toppings because those names are long enough already. Suffice it to say each has at least five ingredients and going half and half is no problem at all. Is your favorite combination no longer on the menu? No worries, they’ll still make it for you. Pinky’s even has a brunch pizza where eggs come over easy or scrambled with bacon and scallions. How fun! 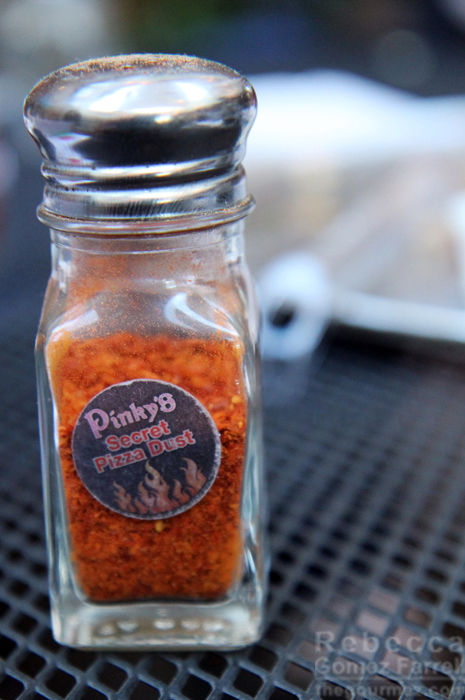 Don’t forget to add plenty of Pinky’s pizza dust. This house seasoning blend is a must try as it adds significant heat to a slice and a touch of sweetness that can be addicting. 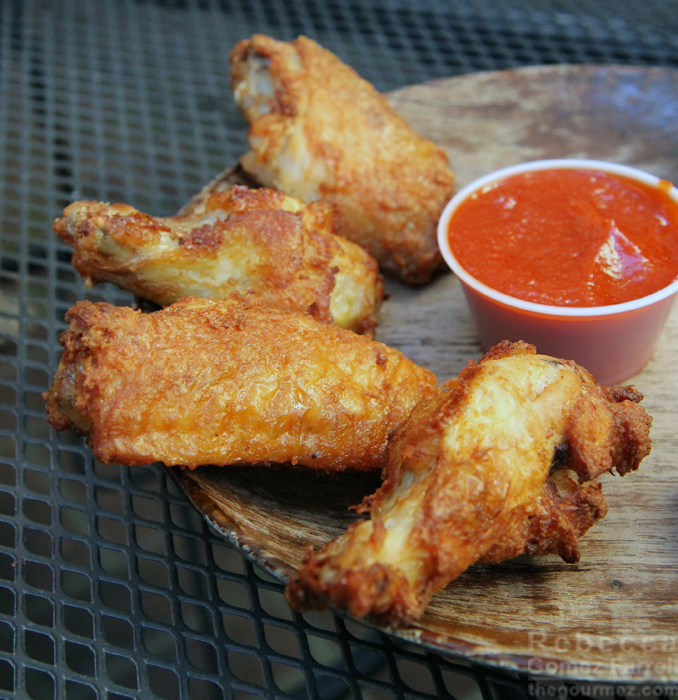 The chicken wings are also good, battered light and crispy and served with sauce on the side. We opted for sriracha. While I’m tempted to overlook flaws because of how much I enjoy the friendly, welcoming atmosphere owner Dan Lilly and his team have cultivated, I am a critic. So I admit I was disappointed in the restaurant’s house salad. 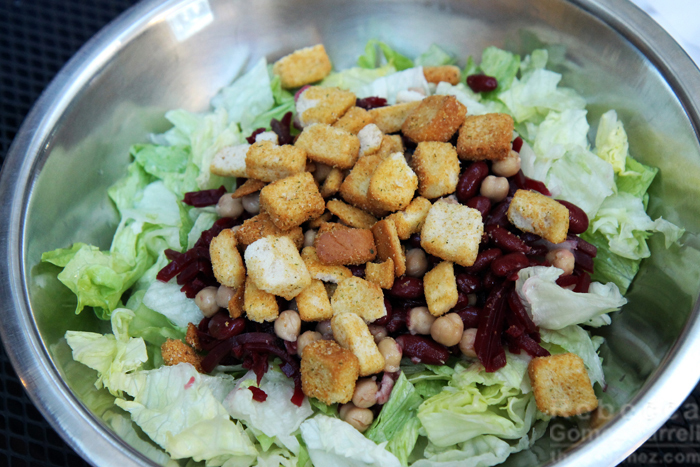 It comes with iceberg, kidney and garbanzo beans, sliced beets, and croutons. That’s a $16 family size portion, which is plenty of salad, but compared to the originality flowing off the pizza combination menu, it’s pretty unimaginative. I don’t mind the occasional iceberg-heavy salad, but I do want something more to liven it up than beans and beets – and I love beets! But these tasted more canned and pickled than freshly roasted. But who’s here for salad? It’s a pizza place! 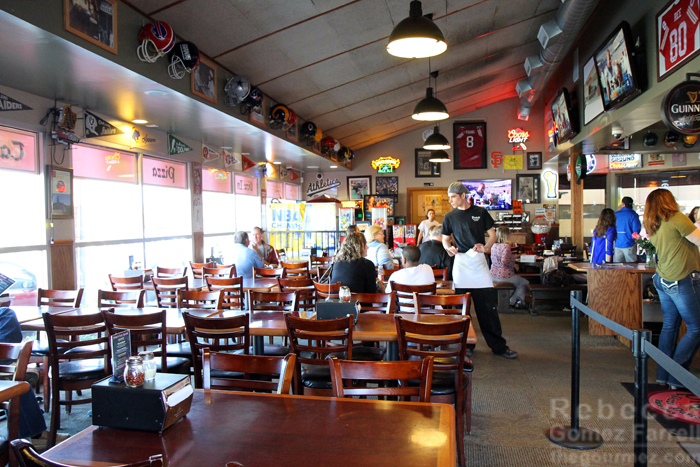 And a sports bar with plenty of good seats to claim for a great vantage point. There’s also patio seating in the courtyard, and yes, you can watch the game on the outside screen taking up one glass wall. That’s precisely what we did for the Superbowl, and what a relaxing location for viewing all those commercials! Pinky’s ran free raffles each quarter and I went home with a great bottle of Frank Family Zinfandel. It wasn’t the wine, or the beer specials, or even the pizza that initially won me over to Pinky’s, though. It was the inventiveness of getting around a full liquor license by offering cocktails made with Concord’s Red Wolf Mead instead of spirits. I love mead! 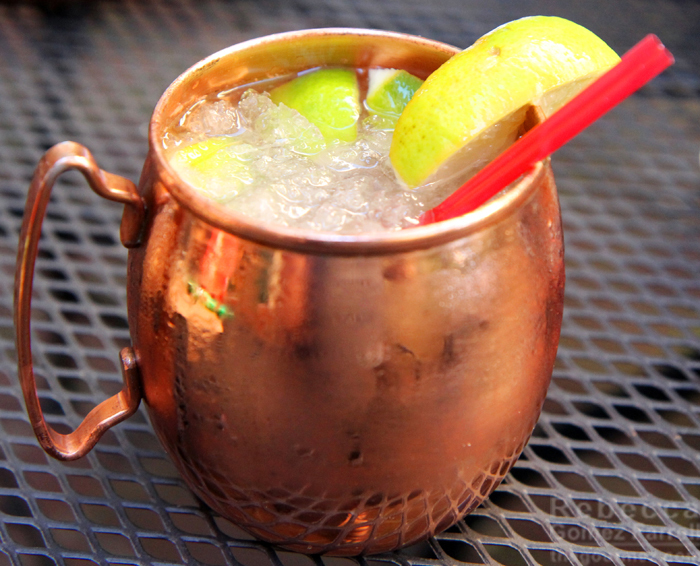 I’ve had that mead-based moscow mule several times now, and the variation on the classic is similar enough to please aficionados and just different enough to satisfy my eternal quest for the unique. Using crushed ice is an excellent choice, and the mead’s apple flavor adds unusual complexity to the drink. It also adds extra sweetness that plenty of lime balances well. I would prefer a ginger beer with stronger ginger, but I’ve thoroughly enjoyed all the mead mules I’ve consumed. They also offer mead-based bloody marys, blackberry mojitos, and a sangria that combines the apple and grape wines. Have I made it clear how deserving Pinky’s Pizza Parlor is of a top-notch grade for its restaurant category? It’s not perfect, but it’s a place where everybody knows your name, a purveyor of pizza just the way I like it, and an offeror of specials that keep us coming back for more. Among neighborhood joints, it is an absolute gem. Reviewed multiple times 2015 to 2016. Hmmmm. That’s not far from my aunt’s place. Will have to investigate. Thanks for the review. What a fun spot. 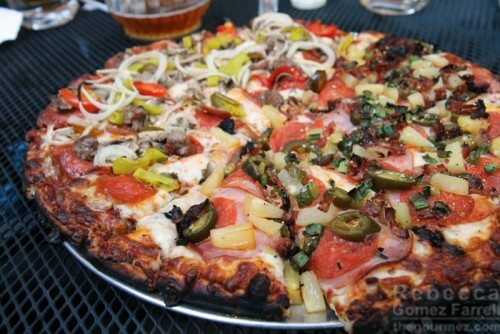 I had no idea there was a California-style of pizza. I’ll have to try it when I’m there for WBC. My favourite pizza in the U.S. so far was in Savannah at Vinnie Van Go-Go’s, which sounds more like the NYC style (but not that greasy). Growing up, of course, it was just pizza to me. But then I discovered that New Yorkers are really particular about the pizza they like and…what they like doesn’t hold a candle to the topping-happy, medium-thick crusts of my youth. CA-style forever!